New EIA data series indicate that total electricity sales in Puerto Rico have returned to pre-Hurricane Maria levels as of April and May 2018 after the longest blackout in U.S. history. However, residential electricity sales appear to continue to lag historical levels, reflecting some continued outages. Hurricane Maria, a Category 4 hurricane, made landfall in Puerto Rico on September 20, 2017, two weeks after Hurricane Irma passed just north of the island. These storms brought powerful winds, storm surges, and major flooding. The Puerto Rico Electric Power Authority (PREPA) utility reported that all 1,570,000 of its electricity customers were without power immediately after Hurricane Maria. Hurricane Maria destroyed much of the territory’s already vulnerable and outdated transmission and distribution infrastructure, and as a result, outages lingered even as power plants resumed operation. Electricity sales in 2016 in Puerto Rico totaled 17.3 million megawatthours (MWh). However, total sales fell to 13.8 million MWh in 2017, largely as a result of outages caused by hurricanes Irma and Maria. Much of Puerto Rico’s electricity infrastructure was damaged during the hurricanes in September 2017, causing total sales to drop below 0.3 million MWh in October, the month after the storms. Residential and industrial electricity sales in October 2017 fell to 3% and 6% of their average levels in the previous October, respectively. Commercial electricity sales were 33% of their previous year levels, as responders prioritized electricity sales to hospitals and public assembly areas. Monthly sales remained relatively low in subsequent months as infrastructure had yet to be fully restored. As of May 2018, Puerto Rico had 1.5 million electricity customers, of which 1.3 million were residential customers. This customer number is not a measurement of customers with working or restored power but rather a count of Puerto Rico’s total electricity customers. As of April 2018, 95% of Puerto Rico’s electricity customers had restored power, while about 62,000 customers remained without power. Most of Puerto Rico’s electricity generating capacity is owned by PREPA, which is the sole distributer of electricity on the island. EIA also collects sales and revenue data from third party owners (TPOs) such as SolarCity projects. EIA collects this data on form EIA-861M for metered generators as well as non-net metered distributed generators at less than one megawatt of electricity generating capacity. Electricity customers in Puerto Rico pay higher-than-average prices when compared to the rest of the United States. 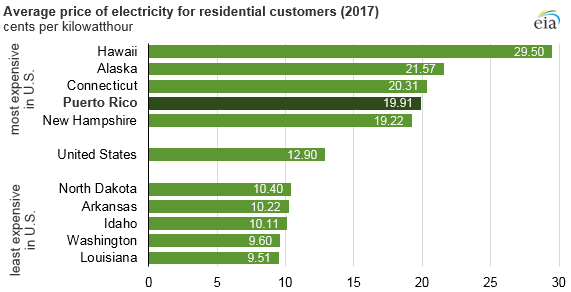 Puerto Rico residential electricity customers paid 20 cents per kilowatthour (kWh) in 2017, nearly twice as much as the average U.S. residential customer rate of 13 cents per kWh. If Puerto Rico were a U.S. state, it would have the fourth-highest residential electricity price, behind only Hawaii, Alaska, and Connecticut. Puerto Rico does not produce crude oil, natural gas, or coal. Nearly all of Puerto Rico’s natural gas is imported as liquefied natural gas, which is imported mainly from Trinidad and Tobago. Puerto Rico produces no coal and imports its coal from Colombia. In 2016, 47% of Puerto Rico’s electricity generation came from petroleum, 34% from natural gas, 17% from coal, and 2% from renewable sources. EIA has updated several of its electricity products to now include data from Puerto Rico. 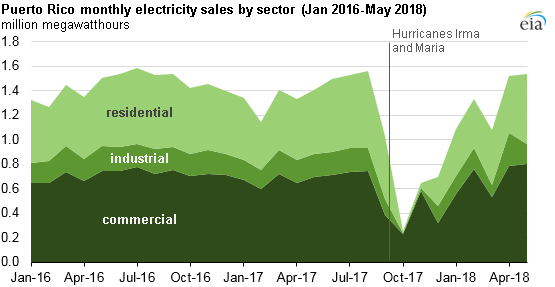 EIA’s latest Electric Power Monthly now includes data on Puerto Rico’s electricity sales, sales revenue, number of customers, and average electricity prices by sector. EIA’s monthly electric generator inventory includes existing, retired, and proposed plants in Puerto Rico at one megawatt (MW) or greater. EIA’s monthly data coverage for Puerto Rico will ultimately be expanded to include power plant characteristics, operations, and generation.